Seventeen local museums including Armagh Robinson Library and No 5 Vicars’ Hill have been recognised at the Museum Accreditation Awards, which is an awards ceremony for museums whose return applications have been assessed in 2018 and who have maintained their Full Accreditation status. The Awards ceremony was held recently at the Naughton Gallery at Queen’s University Belfast. It was attended by the local museum sector and NIMC members. 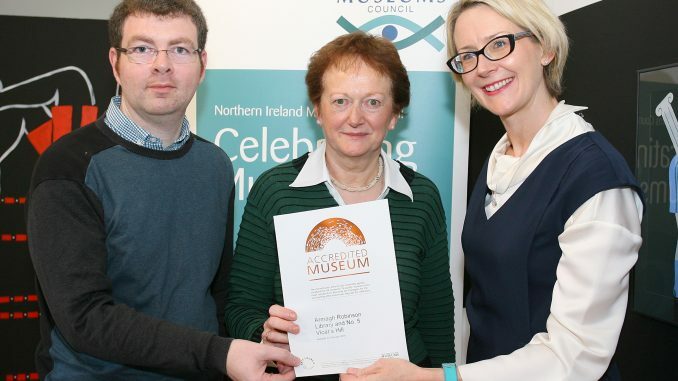 Alison Cosgrove, Head of Museums and Libraries at Department of Communities and Sinéad McCartan, Director of Northern Ireland Museums Council presented the museums with their Accreditation certificates on the day.